NEW DELHI -- The two people who fell to their deaths from a popular overlook at Yosemite National Park last week were an Indian couple who studied engineering together. Dr. Nisha Kuruvilla, a professor at the College of Engineering, Chengannur in the Alapuzha district of Kerala state told The Associated Press Tuesday that 29-year-old Vishnu Viswanath and 30-year-old Meekakshi Moorthy were her students and had gotten married at a Hindu temple in Kerala four years ago. Kuruvilla described them as "very good students" and "fond of traveling." 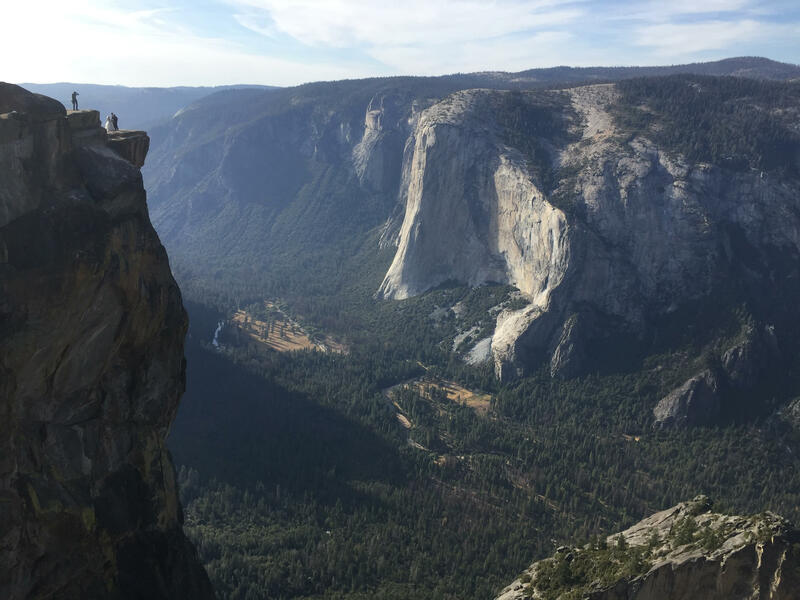 Park rangers recovered their bodies Thursday from about 800 feet below Taft Point. Yosemite spokesperson Jamie Richards said she didn't know how the rangers reached the bodies but they worked all day in the "challenging area." Officials are investigating which part of Taft Point the couple fell from. Taft Point is some 3,000 feet above the famed Yosemite Valley floor. The investigation could take several days, she said. The Taft Point overlook has some railings but visitors can walk to the edge of a vertigo-inducing granite ledge that doesn't have a railing and has become a popular spot for photos posted on social media. "It's a super-popular place in Yosemite. Really popular for engagements, proposals, weddings," photographer Matt Dippel told CNN. "There were at least three or four different brides and grooms up there doing their post-wedding photos, so it's definitely not an uncommon thing to see up there." More than 10 people have died at the park this year, six of them from falls and the others from natural causes, park spokesman Scott Gediman said. Last month, an Israeli teenager fell hundreds of feet to his death while hiking near the top of 600-foot-tall Nevada Fall. The death of 18-year-old Tomer Frankfurter was considered an accident, the Mariposa County coroner's office said. Taft Point is also where world-famous wingsuit flier Dean Potter and his partner, Graham Hunt, died after leaping from the cliff in 2015. The pair were experienced at flying in wingsuits - the most extreme form of BASE jumping - and crashed after trying to clear a V-shaped notch in a ridgeline. BASE jumping stands for jumping off buildings, antennas, spans (such as bridges) and Earth and is illegal in the park.